Angelic Magic: Creating Archangel names in sigil form for Raphael, Michael, Gabriel & Uriel | QuantumPhoenix.net – Esoterica, Paganism & Ritual Magic. If you do an internet search for the Archangel names, firstly many variations come up, and second, you’ll see a whole lot of shops selling talismans & pendants with all sorts of symbols and sigils, with a mixture of Hebrew writing included and all sorts of squiggles. The question is, how far do you trust them? How accurate do you think those sigils are – and how do you even test to ensure they are accurate? (unless you are already an expert at those matters). Am not saying anyone out there is deliberately trying to mislead anyone. But my own extensive internet (and hard printed books) searches have shown me that there’s a lot of smudging and confusion in this matter… People are sometimes just copying one another’s websites/ blogs or info..and the mistakes/ misinformation is either spreading or getting amplified (like Chinese whispers). There are worlds, realms and beings out there – magical, etherial and the supernatural – that are best left alone. Because once you disturb them, or open a door to their realms, or if they happen to disturb you.. life is *never* going to be the same. Years ago, I had dabbled…all so briefly..with some sigils.. just playful.. for a day or so.. and the psychic reaction I got from that was so shocking and intense, that it scared me. I erased all traces of that experiment..and put it away for years! Until last year! When I had cause to open it up again.. But this time it’s different. I’m being extremely careful.. and double..triple checking every detail.. It started as a personal need to know what I can trust ..and then it became an interest…and then it became a promise.. that what I know I must share with others.. Because there are those amongst you.. who are seeking.. out of curiosity, interest or worse…desperation..! That’s why this is being written.. To help those who are seeking. Is it my place to help? Do I know enough to help? Possibly No..for both questions. But I have a new philosophy that I have been living by now..for almost half a year.. If you are working with Angels, how ever small or large an involvement, you have to live by some high ideals and standards.. There is no faking it…or suppressing it or denying it.. They will know. So you have to simply start being it…your best self.. your noble self.. your angelic self! So with those disclaimers / warnings in mind, let’s begin. I won’t go into the full history or detail of it.. You can look it up on wikipedia .. or the `Golden Dawn’ (for first hand knowledge/ reading). I will say this.. if you don’t know it,, and you were looking for it …it will have been one hard journey. Information online is fragmented..and bits seem to be kept apart. I eventually found it…and suddenly it all made sense.. So am writing about it first..(so that it saves you the trouble). It’s a key that practitioners of `Golden Dawn’ western magical tradition used in their ceremonies, rituals and magical work. I have re-created only the central section here. 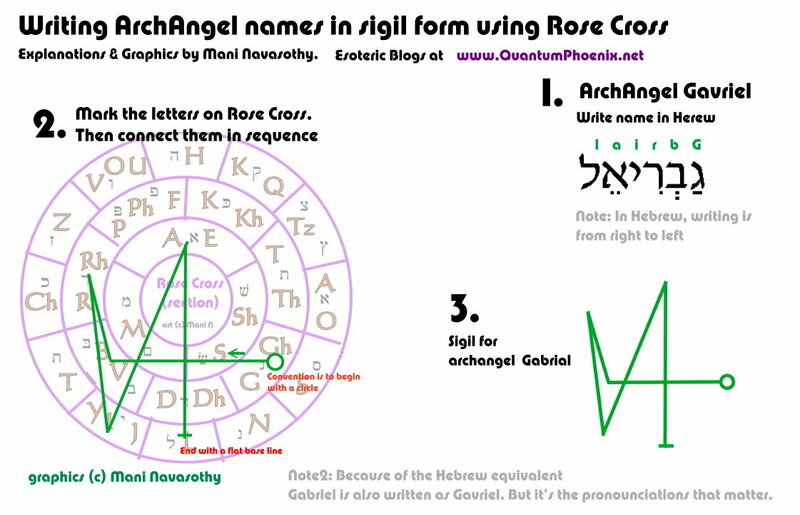 Not only that, I have also combined the Hebrew letters/ sounds that match the english letters/ sounds as near as possible..
Am only referring to the four Archangels used in the `Ritual of the lesser banishing of the Pentagram’ – mainly, Raphael, Michael, Gabriel and Uriel… for East, South, West and North directions respectively. These names were originally said in Hebrew, and were written in that langage. So their pronounciations are slightly different.I have gone back to the Hebrew forms (given in example)..
Start by writing the specific name in Hebrew (or find a hebrew version online!). Remember Hebrew is written from right to left..
Mark out the letters of the name on the Rose Wheel. 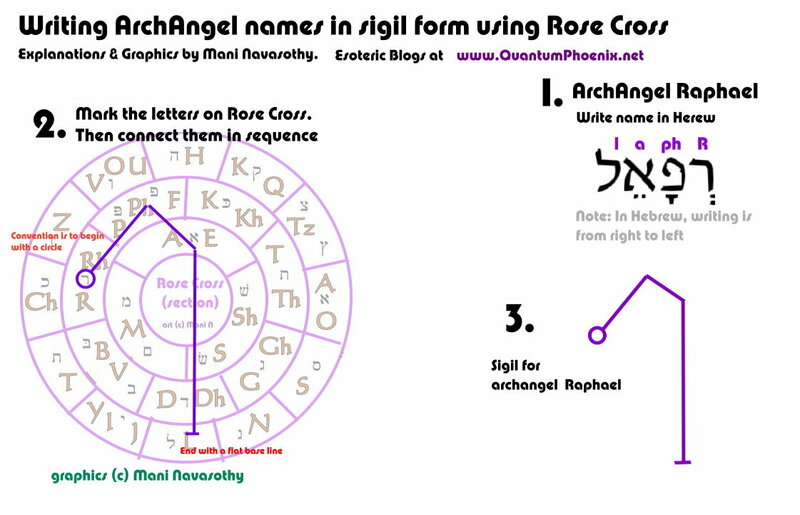 Now in sequence, trace over the letters, thereby drawing the sigil of the Archangel name. Here are fully illustrated examples I have created. 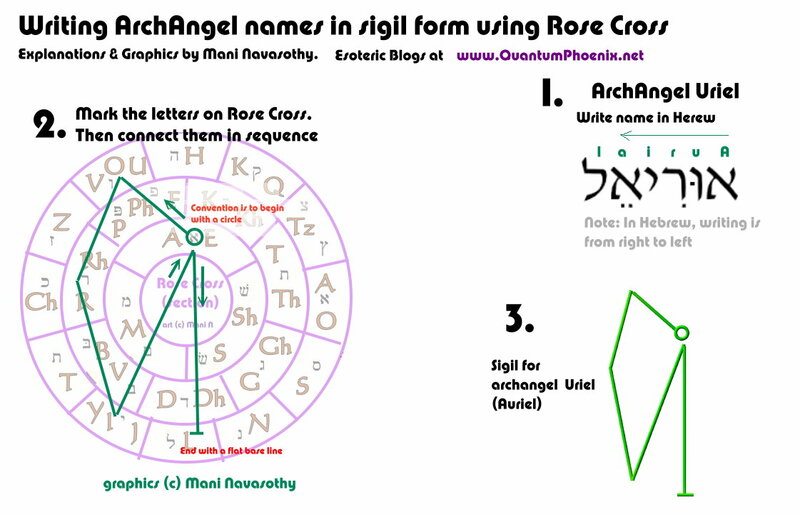 With these 4 examples, and the Rose Wheel diagram above, you now have the tools and techniques to start creating sigils of other Arch Angel and Angel names in sigil forms..
Hi very informative but can I use the English Rose Cross to draw the sigils? I am using the Archangels English name but my sigils look nothing like yours! For success, use Abraham Abulafia’s technique of angel name pronunciation, as is is the closest technique for contacting the power of the angel. Start on angels FIRST, before using of contacting Archangels. and DO NOT use the English versions of the names. How do you write Raguel on the rose Cross? I googled the hebrew letters, but it’s not exactly the same as what you have. DO NOT use the ENGLISH version of these names at any cost, ONLY use the Hebrew. hello mani, if i want to have a tatoo of protection sigils do you think it could be dangerous energeticlly wize? Hi.. Many of my friends have tattoos they have done as protection. I myself am considering it. But if you mean specifically an archangel name/ tattoo, as long as you are careful…and feel completely safe about the design..after you have seen it or created it yourself… I don’t see why it will be dangerous. Just don’t dabble with any designs..that you are absolutely 100% not sure about. I am pondering what tattoo to have..for almost 15 years..and still have not decided on it.. That should tell you how careful I am.. 🙂 Best wishes. Yes I have a similar question (FULL DISCLOSURE) I am wanting to have Gabriel’s sigil tattooed on my wrist to celebrate the arrival of my son. But I wanted to know if it was unwise or as Yonatangeron said “dangerous energetically wise”? The last thing I want to do is bring about bad energy from something intended to be out of love. 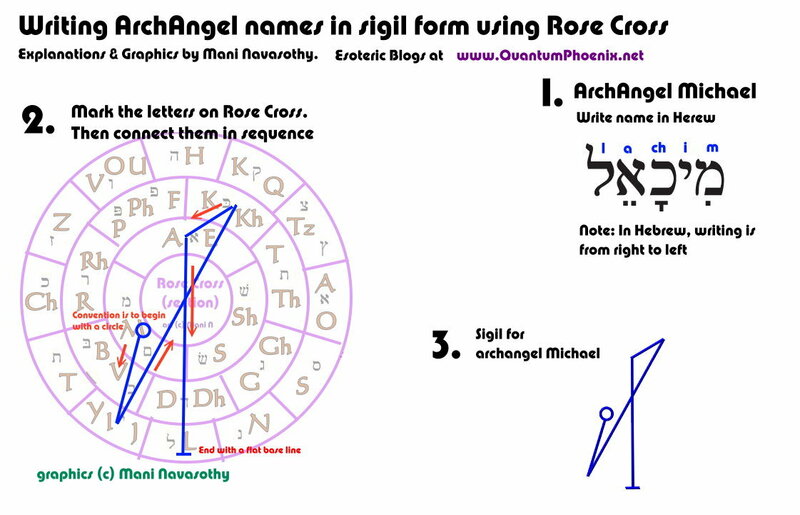 I am very, very disturbed by today’s trend of Anglicizing ancient Angel and Archangel names and the use of English tables and arrays to make magical Angelic Sigils, Seals Amulets and Talismans. This is very, very dangerous and very incorrect. These entities are of ancient semitic origin. There is a very true occult saying that says – To know a thing’s true name, gives you power over it. However the conversion of these Semitic entity’s names, does NOT give you access to these entities. There are many willing demonic type entities that step in and assume the role that you expect to work with instead – an often deadly result. The Archangel LAKIM (I only use the English version of the actual Hebrew letters here to show the difference – note: read from right to left) is NOT the Archangel Michael, or in the previous Hebrew style LACHAM (which would include the letter “cheth” Ch in the name and NOT the correct letter “kaph” K). You use the wrong name in your example with the Rose Cross, which can work, however the true Sigil Rose is of another letter arrangement and wields a lot more power. I also notice that you use the Name Uriel, which is in fact Auriel (if you bother to check your Hebrew spelling), another serious mistake by the occult commoners that have no clue that transcription errors and intentional blinds were used by earlier magicians and occult practitioners. Most of these name transcription errors however were through sheer ignorance of the uneducated practitioner. Most of them did not know Hebrew, Arabic, Aramaic or ancient Persian and seriously mis-spelled the names. Others copied these results blindly without question (even today). 1. 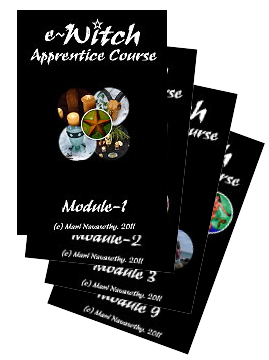 Stay away from Angelic Magic and the teaching of it, until you grasp this basic fundamental concept, and also have some idea of what you are doing. 3. Above all – DO NOT turn these names into English at any cost, this will only backfire and manifest devastatingly in your life, trust me, I have worked successfully with angels for many years now. Angels are massive and very powerful beings of raw universal energy (much like a contained, conscious, nuclear bomb blast), not these fluffy, white winged, human like images that most people think they are. A true glance from an angel will destroy you and everything about you and they ARE NOT to be played with. Thank you for your advise.. While it is true that to know something’s name gives you power over it.. and in wicca we have a saying, you must be stronger than the powers you invoke’.. with regard to angels, the sensible ones amongst us are NOT trying have any power over Angels. We are calling them for help. Also in wicca, we are used to invoking gods & goddess energies into ourselves. And we are not doing that with Angels. (but many wiccans do use the Lesser banishing ritual of the pentagram, from Golden Dawn, where old Abrahamic god names (Hebrew) and archangel names are used for clearing space an d protection. The internet is full of misinformation.. 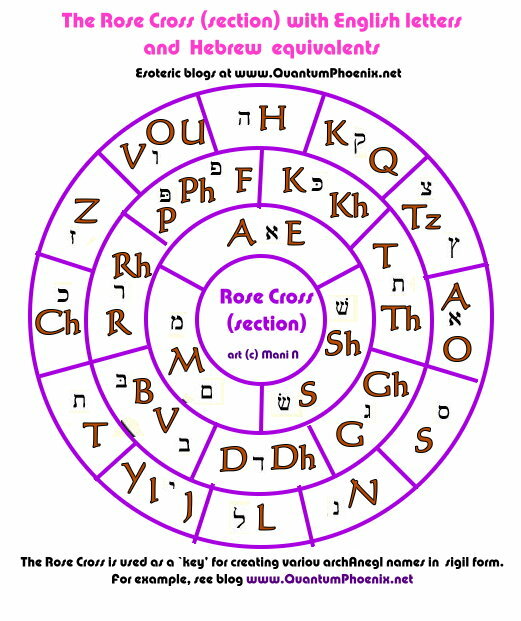 I can see that, even with my limited knowledge of Angelic wrk.. and all I have done is to take the names as I know them (hebrew versions) and use the rose wheel as given by Golden Dawn, and show how that can be written as a sigil. Of course anyone using them must do their own studies and make their own judgement. Am keeping your advise / warning on my blog..so that anyone reading it may be fully informed. Pardon me L. auriel but you seem to know much about angelic magic if so can you illuminate me about it or where exactly to get that kind of information.thanks. Archangels are indeed raw energetic power, but they are also benevolent and they very much like communicating with human beings. You are right, they are not fluffy, they don’t have baby faces and they don’t go around dressed in bed sheets. But they do appear to us in human form. I have daily contact with Zadkiel and Uriel and they like to present themselves as rather heroic. Zadkiel likes looking like a musketeer while Uriel shows himself as the most magnificent male you have ever seen, dressed in red and gold. I do advise everybody not to take any notice of L. Auriel’s comments. They are just not true. Believe me. The archangels are our friends and our brothers and sisters. What’s more, they wouldn’t have it any other way. Am no expert nor even long-term experienced in angelic work..but just doing my little best to spread personal empowerment to all. And I certainly don’t believe that any god/ goddess / angels who truly care for humans are going to get all `fire & brimstone & nuclear’ about us `children’ who call our mothers and fathers by many names…like `dada, daddy, pap, pappa, mom. mummy, ma’ and so on. Whatever names we use ..out of our limited learning and conditioning.. our parents always know that it is them we are calling when we need and call them 🙂 That after all is unconditional love. I’ll have to find the `correct’ Hebrew pronunciation and have a go.. leave it with me. You mention doing follow up blog to this. I was wondering have you completed to give us you experience working with the angelic sigils. Could you please provide a link if you have. Angel’s are intelligent. They understand our weaknesses and misconceptions. They understand that there will be mistranslated names. You can call them Steve or Bob or anything if you are kind, loving, respectful and truthful. L. Auriel I understand your concerns and the fury and intensity behind your eyes. I see your spirit from here. Peace to you. Love to you. Quell yourself and center yourself. Mankind will find their way. Caroline makes the point. Of course they are powerful. Also consider if any wandering spirit tried to “pretend” to be Michael. Ha! I would like to see that interaction! Is there a way of combining the 4 main Archangels ‘ sigils together into 1? Please advise—- Thanks! hi i just came across your website. would like to ask you for some advice. i just ordered two amulets from a website. i special order and requested it, two archangels, back to back on the pendant with individual sigils on each side. i did not merge both on one side. will it be ok?? i am hoping to ask the angels to bless my kids with their studies. pls advise me? many thanks. Thank you for sharing this information. I work with the archangels and do believe that our intentions is what they respond to. If you mispronounce a name but in your heart you are asking for that angels help they will kindly respond. I love your page here. I just recently learned Hebrew and was amazed how I could read it on here. I followed GD teachings for a decade now, and I must tell you the Rose Cross has many more secrets. Ill give you a hint. If you do not already know, study the color wheel then learn the colors of the cardinal signs then look at the rose cross in color. It will be worth your time. Perhaps now (if you haven’t already) have a page showing how to evoke these beings by opening the sigils. If you need any help just reply to this. Great page! Keep up the good work. ps. if you find any mistakes / errors in my post re: this work..please do point them out.. Thank you. I have tested your sigils with radiesthesia, all of them emanate subtle higher harmonics of the three major beneficial energies found at the center of a circle. If the sigils are truly as good a symbol as can be found to represent these angels, they are not as powerful as other symbols of beings by a long shot. But they are all beneficial to varied degrees. They do not contain any content of the most detrimental harmonics. As well this persons idea about names I have not experienced such. Things that have detrimental harmonics have them under anything that represents them it is simply a matter of degrees of resonance. You don’t summon something detrimental with a beneficial harmonic they don’t like how it feels at all. If you look at a symbol and it gives you anxiety of the likes of the mjolnir symbol or the black sun should of Norse mythology. You don’t invoke these symbols you don’t make it your business to be as resonant with it as possible at all. Less it’s your plan to do harm to yourself. If these two symbols don’t give you a bad feeling that is cause for concern, it means you are not sensitive enough to detrimental energy which can mean you have too much in your presence/system and are going to attract it to you. With these 3 major beneficial harmonics what possible harm is there? If you want something tested so as to be more careful let me know send me an image of it, also send me anything you think is a really beneficial symbol please I like to test those more haha. Read the whole essay. Just amazing. Just one question. Can we start using straight away or do they need specific Attunement to them. Hi thank u for all the informations about sigils and archangels. I would like to make something for protection. If we put on a round metal-piece in one side a sigil of an arcangel and on the other side a human name is it ok? Or curve in a ring the arcangels-sigils the protectors of north, south, east and west do we have conflict? Thanks again! Hello. I have some exams next days so i made an altar with some candles and personal/christian simple objects. I also made the rose cross of Michael and Uriel exactly how you have it here, actually printed it, except the line of the name that i draw myself. After i made and prayed a bit i went to sleep but my mind was too full (i actually fall hard asleep everytime) so i decided to destroy the 2 pappers by cutting them in very tinny pices, i didnt want to bother the archangels or play with energies i dont understand. It is all safe what i just tried? Hi Doru.. I have had some experience of creating sigils…and it being quite strong..that I decided to ground and destroy them. Until I got rid of every last bit of the sigil..the energy was still active/ affecting me.. 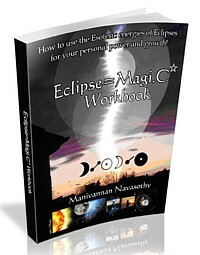 Since that day (many years ago now)..I am always cautious of starting any such high magic…and always have a built in plan for destroying sigils and thus the connected magic..if it is needed. Anyway in your case, firstly… it’s okay to bother the angels or Archangels and ask for help. I’ve always asked Gods, goddesses, archangels for help..and don’t feel i can’t ever `bother them’ …I see them like gentle nurturing guardians/ parents who I can ask for help.. not some tough criminal layer you only call on when you are in deep trouble. Secondly.. the pieces of paper you used..and cut up…I suggest you fully burn them…and the ashes.. wash them off in a flowing water…a stream..sea…or flush down in a sink with plenty of water. Alternatively you could bury the ashes ..and let them ground on Earth. Finally… for the duration the sigils were complete ..their magic would have started to work.. So I’d say …just politely thank those angels you called on for their brief help..and politely send them away (ask them to do so). And thank the deities you worship for any wisdom gained..as a result of all this. Blessings. -Mani (ps. apologies for late reply..I hadn’t seen the comments sooner). Despite translating the angel Laylah’s name to Hebrew I couldn’t figure out the correct sigil for her. Could anyone offer help? I am quite confused as to the first two characters ( עַזְ ) and where to find them on the chart. How is one to know which to use? Is it suggested here to not convert your own name to Hebrew and then create a sigil? Does it matter where in the area the letters are contained to have the connection point? What does one do for consecutive same characters, just pick two points within the area to connect?